Click the photo to embiggen. But don't feel obligated. This was a gift from my brother & sister-in-law. Ever since my youngest brother and I started running one race a summer, we’ve always been amused by the usually less-than-flattering photo results, from the lower-lip mid-bounce freeze-frame to the eyes-half-closed unintentional pout to the “I’m trying to throw a double-thumbs up and a wink toward the camera but they snapped it too early and I look like an idiot” that my brother has mastered. 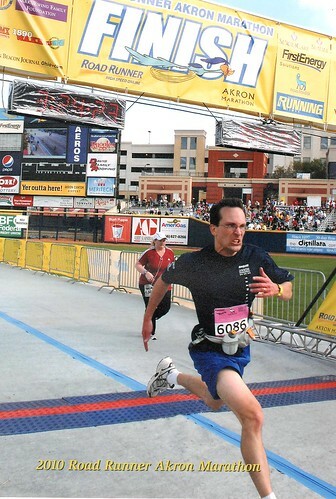 I was stunned, then, to find this among the shots of me participating in the relay in this year’s Akron Marathon, because it makes me look, you know, like I’m running, as opposed to simply trying not to keel over. Is there any way I can avoid this thing without betraying my cool exterior? September, 1981: I’m 10 years old. Apparently the neighborhood dare-of-the-day was to kiss this tomato worm found in our neighbor’s garden. I’ll pass, thanks. 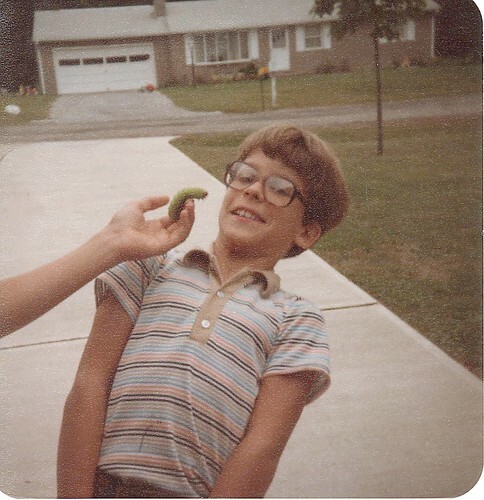 I mean, with my ink-stained stripey shirt and my +2 Plastic Rimmed Glasses of NerdVision, I’m already pushing the boundaries of TOO AWESOME TO CARE, so why risk sucking all of southern Lake Township into a black hole of nonchalance by showing off and smooching a Manduca quinquemaculata? Hey, I had plaid pants, too! One of the colors was this garish color of pink. But I loved them at the time, despite my hatred of pink, even then.